Now celebrated annually on July 28, the King’s Birthday in Thailand is an annual patriotic holiday. Fireworks and acts of good deed mark the occasion. King Bhumibol Adulyadej of Thailand was the longest-reigning monarch and the world's longest-ruling head of state before his death on October 13, 2016. He was dearly loved by many in Thailand. His birthday, December 5, is still celebrated as Father's Day in Thailand. King Maha Vajiralongkorn succeeded his father as King of Thailand on December 1, 2016. The King's of Thailand's Birthday public holiday was then changed to July 28. Of all the big festivals in Thailand, the King’s Birthday has traditionally been important to Thai people. Seeing supporters with tears of endearment at ceremonies isn’t uncommon. Sometimes images of the king on television screens would cause people to put their heads on the sidewalk. Many supporters decide to wear yellow — the color associated with Mondays, the day of the week both King Bhumibol and King Maha Vajiralongkorn were born. Early in the morning, alms will be given to monks; temples will be especially busy. Streets are blocked off; music and cultural performances take place on stages in cities, and special markets pop up. 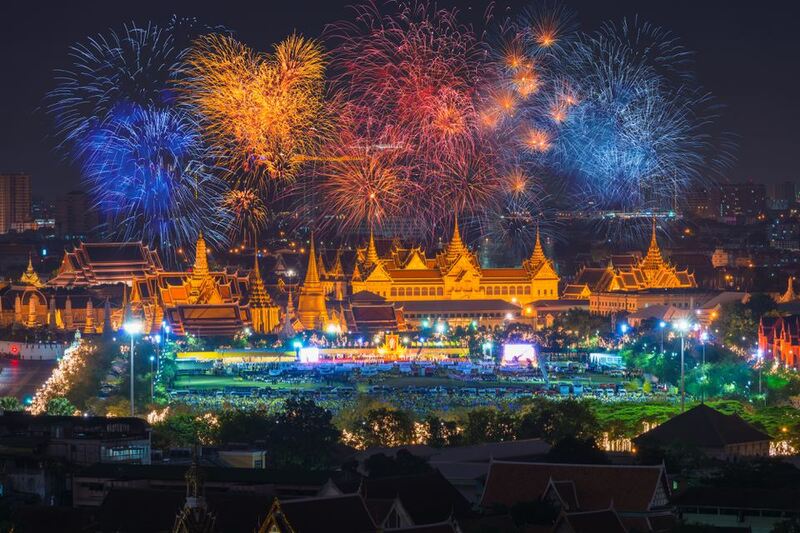 Firework shows are held in Bangkok. Some people choose to hold candles to honor the king. Sometimes white flags are waved with chants of "long live the king!" Until his final years, King Bhumibol would make a rare appearance and pass through Bangkok in a motorcade. With health getting worse over the years, King Bhumibol spent most of his time at the summer palace in Hua Hin. People would gather outside of the palace in the evening to hold candles and honor the king. Tourists are invited to join and participate as long as they are respectful. Obviously, this isn't the time to be rowdy or make jokes. If the King's Birthday celebration on July 28 happens to be a weekend, the following Monday is usually taken as a public holiday with many people given time off of work. The old date for the King of Thailand’s Birthday celebration is still considered Father’s Day. Children across Thailand will honor their fathers on December 5. Bhumibol Adulyadej, the last King of Thailand, was the longest-reigning monarch in the world, as well as the longest-serving head of state, until his death on October 13, 2016. King Bhumibol was born in 1927 and took the throne at the age of 18 on June 9, 1946. He ruled for over 70 years. For years, Forbes listed the Thai monarchy as the wealthiest in the world. Throughout his long reign, King Bhumibol did a lot to improve daily life for the Thai people. He even held several environmental patents, including ones for waste water processing and seeding clouds to make rain! Following the tradition for kings of the Chakri Dynasty, Bhumibol Adulyadej is also known as Rama IX. Rama was an avatar of the god Vishnu in Hindu belief. Only used in official documents, the full title for King Bhumibol Adulyadej is “Phra Bat Somdet Phra Paraminthra Maha Bhumibol Adulyadej Mahitalathibet Ramathibodi Chakkrinaruebodin Sayamminthrathirat Borommanatthabophit" — a mouthful! Unknown to many people, King Bhumibol was actually born in Cambridge, Massachusetts, while his father was studying at Harvard. The king is often depicted holding a camera and was fond of black-and-white photography. He played saxophone, wrote books, did paintings, filed patents, and enjoyed gardening. King Bhumibol was succeeded by Crown Prince Vajiralongkorn, his only son. Many streets may be blocked off in Bangkok, making transportation more challenging. Banks, government offices, and some businesses will be closed. Because the holiday is a somber occasion and very special to Thai people, visitors should be quiet and reverent during ceremonies. Stand and be silent when the Thailand national anthem is played each day at 8 a.m. and 6 p.m. The Grand Palace, one of the top attractions in Bangkok, may be closed on July 28 for the King's Birthday and December 5 for Father's Day. You can call +66 2 623 5500 ext. 3100 to confirm. Alcohol cannot be purchased legally on the King’s Birthday holiday. Disrespecting the King of Thailand or the royal family is a serious offense in Thailand; it’s officially illegal and strictly enforced. People have been arrested for speaking negatively about the royal family. Even making jokes or criticizing the royal family on social media is illegal. Those convicted have received very lengthy prison sentences for doing so — tourists are not exempt. Because all Thai currency features a portrait of the king, stepping on or damaging money is a serious offense — don’t do it!